After the death of her father when she was eight, Ruth Hild learned responsibility earlier than most. She watched over the pigs, the chickens, and many of the household duties, while her mother and brother managed the fields of their farm south of Springfield, Illinois. Her later industriousness is not difficult to understand. Her exuberant quilts are everywhere in her home, providing warmth and sparkle as the colors of each gracefully blend with their neighbors. It is a lively, but also soothing place to be, combining quilts she has made with others she enjoys collecting. 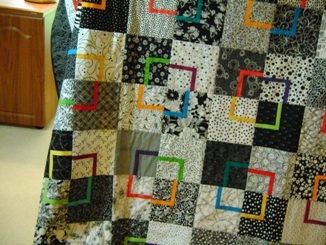 She came to be a quilter in a roundabout way after her mother began to quilt in the 1970s. After her mother’s death, many quilts were left unfinished so Ruth decided to complete her mother’s work. Of course, she didn’t stop soon enough to avoid the unexpected addiction that soon engulfed her. Looking at her quilts, one particularly notices the mathematical precision they involve. This is not surprising considering she taught math in high school and at College of DuPage. She was also a math tutor for over 25 years. She could not help but use its principles in her work, even down to a teeny grid she drew on graph paper to make her own very small paper foundation pieces for a charming red and white miniature. Her ideas for quilts most often come from fabrics. She frequently ponders the question, “What can I do to make differing fabrics work together?” Once she knows the answer and has a design in mind, she begins her intricate machine piecing, quickly acknowledging that she does very little hand work. She seldom makes the same pattern twice, preferring to try new things whenever possible, adding her own unique twists and ideas. She has also created several stunning jackets using quilting techniques. A long-time member of the Prairie Hearts bee, Ruth is also a charter member of RQG. She has served as the guild’s president, treasurer, and nominations chair, as well as serving currently with Nancy Lindberg as special events co-chair.